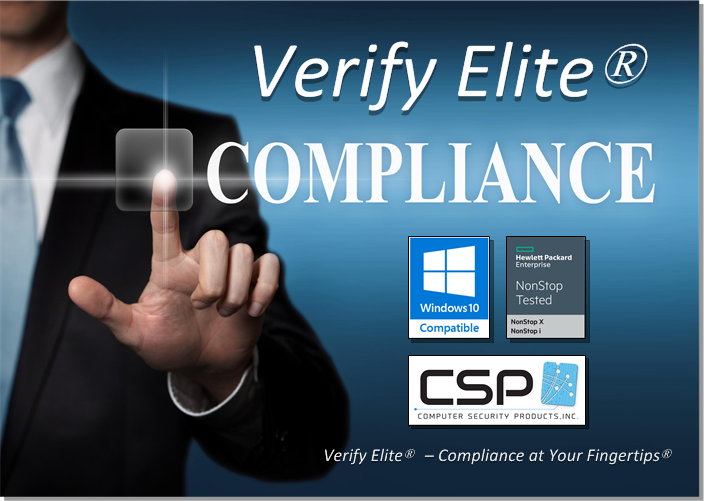 Verify Elite® is a complete security compliance solution, able to continuously monitor your NonStop systems to ensure compliance to security standards such as such as PCI DSS, SOX, HIPAA and GDPR. Featuring security compliance monitoring, file integrity monitoring, and a multi-node fileset compare feature, Verify Elite® puts Compliance At Your Fingertips. Verify Elite’s Security Compliance Monitor utilizes a database of NonStop security rules to verify system compliance with security standards such as PCI DSS, SOX, HIPAA and GDPR. Security rules are based on CSP’s world-class online repository of NonStop security rules and best practices, CSP-Wiki. Access to CSP-Wiki is free to CSP customers and eligible members of the NonStop community. Verify Elite’s security rules can be customized as necessary to reflect your compliance requirements and internal policies. Verification checks can include subsets of rules and can be scheduled regularly to provide continuous compliance monitoring. Verification checks produce detailed compliance reports, identifying compliance issues categorized by severity. All compliance reports are maintained in an historical database for easy review. Since all verification checks are audited, CSP’s Alert-Plus® product could generate immediate non-compliance alert notifications such visual alarms, event messages and emails. For more information about Alert-Plus®, click here. 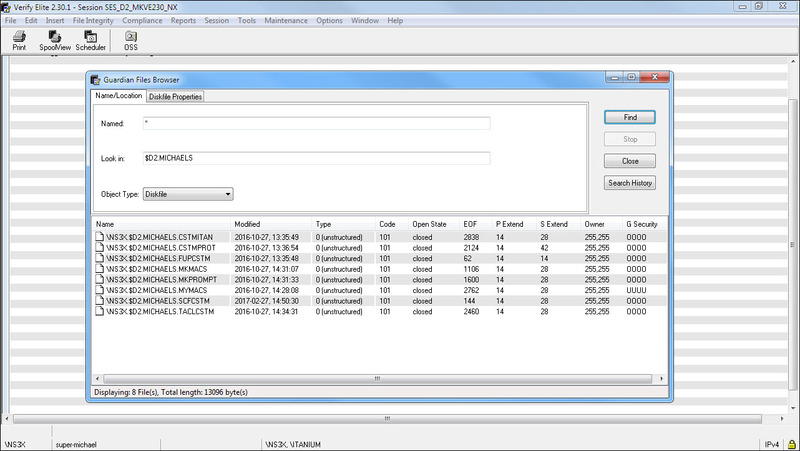 Verify Elite’s File Integrity Monitor can monitor the integrity of both Guardian and OSS files. The files and file attributes to be monitored are contained in a fileset definition. The execution of file integrity checks can be scheduled regularly in order to continuously monitor the integrity of your most important files. 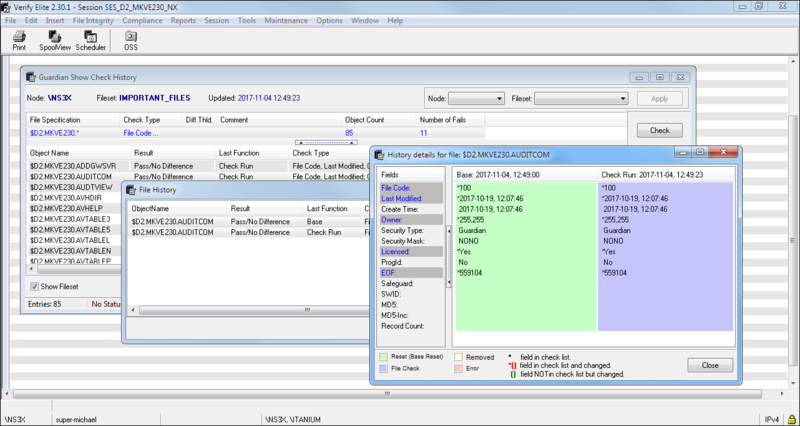 Each file integrity check collects the specified file attribute information for each file in the fileset. A signature is created for each file, which is then compared to the signature created during the previous file integrity check. Detailed differences are reported. 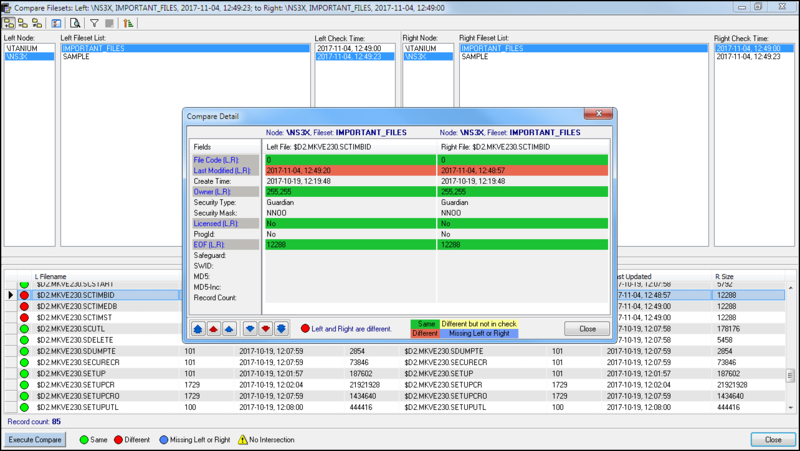 Since all file integrity checks are audited, CSP’s Alert-Plus® product could generate immediate integrity alert notifications such visual alarms, event messages and emails. For more information about Alert-Plus®, click here. The regular comparison of fileset copies should be a part of the process to ensure the integrity of your files. For example, files that are replicated to backup environments or remote nodes need to be regularly compared to production files to ensure their integrity. 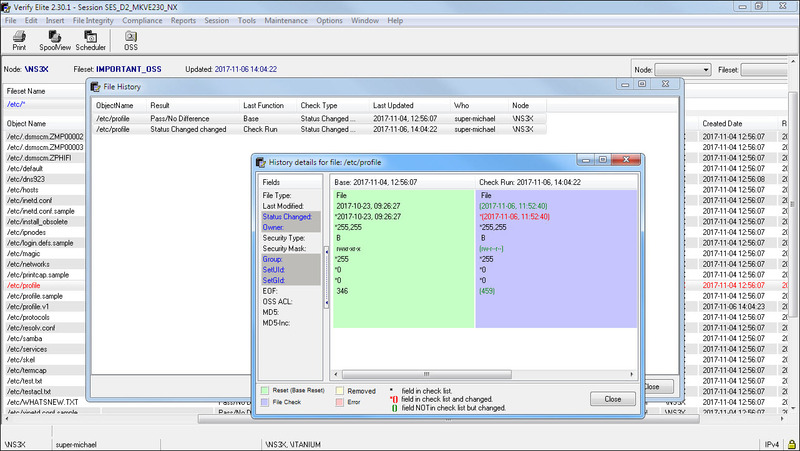 Verify Elite’s Multi-Node Fileset Compare feature permits the comparison of filesets located either locally or across NonStop nodes. Using the file attribute information collected by the file integrity check process, Multi-Node Fileset Compare can compare any two selected filesets, identifying both the matches and differences between the file attributes in each. If a discrepancy is found, investigation and possible remedial action can then take place. For more information about our Verify Elite® product, please download our PDF brochure below, or Contact Us.